In love with Brittany where he spent all of his life, he understood the intimate feeling for beings and for things; he ignored nothing. He knew the small ports surrounded by our Breton hills; he noted the red sails on the green and blue seas, the teeming of the fishermen leaving and returning to the dock. His little figurines were excessively studied for their movements. The people and the animals that he placed in his landscapes, of rich and opulent tones were always there at the place where they should be. He examined the horizon with his eye while walking within the nature that he loved. Coasts, forests, valleys, in every season, he observed them with all of his senses and reproduced them accordingly, with all of his spirit and sincerity. Throughout the nineteenth and into the early twentieth century, French landscape painting progressed and changed with ever increasing frequency and verve. Its early proponents such as Jean-Baptiste Camille Corot and the Barbizon painters began to change the way artists viewed and interacted with nature, but also influenced the way landscape painting was received. By the 1860s landscape painting had become popular with the public and critics alike. As this genre progressed, works took on new aesthetic dimensions that were determined largely stylistic changes which, beginning in the 1870s, were revolutionized by the Impressionist group. Oil paints in tubes now allowed artists to escape to the country and paint in plein-air without hassle. Not only did Impressionism influence artists by changing their way of viewing and translating nature within a momentary reflection, but they introduced a new palette of vibrant and rich colors that allowed the artist to create their own environment within their painting. One of the major schools during this period which essentially created their own distinct style of painting and which was the heir to these traditions in French landscape painting was the school of Pont-Aven, located in Pont-Aven, France, which is now most often recognized by one of its major figures, Paul Gauguin. Moret was born on December 12th, 1856 in Cherbourg, France, in the Manche region of Normandy. His life up to his military service in 1875 remains somewhat of a mystery, but it was during this military period when his artistic career began. While in Loreint for his service, he served under the command of Colonel Jules La Villette who noticed his interests in the arts. He took it upon himself to introduce Moret to a local artist who ran an atelier in the town, Ernest Corroller, a drawing professor. Typical to the area and influential for the direction of Moret’s theme was the fact that Corroller himself was a marine painter and exhibited regularly at the Parisian Salon. 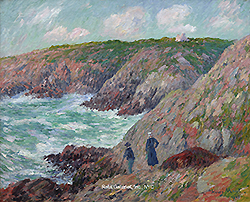 Under Corroller, Moret was introduced to a thoroughly academic style of painting which would betray Moret’s style late in life and which relied on the past masters of the French landscape tradition such as Corot and Courbet; thus the palette he and his studies worked with were dark, muted tones atypical to the current artistic trends of the Impressionist group. Even though Corroller presented Moret with traditions of the past, he was the one who not only introduced the theme of marine painting to him, but also introduced him to plein-air painting. With Corroller’s lessons in hand, Moret soon registered at the Ecole des Beaux-Arts in Paris on March 22nd, 1876, taking up residence in the atelier of Lehmann and later, from about 1880-1883, the history painter Jean-Paul Laurens. It was in 1880 that he first exhibited at the Salon, a work entitled La Plage de Locqueltas a Marée Basse; Cote de Bretagne (The Beach at Locqueltas at Low Tide; Coast of Brittany). It was during these early years that, under the influence of his previous training, his paintings recalled the traditions of the Barbizon school. During his studies in Paris, Moret kept in contact with Corroller and often returned to Brittany. 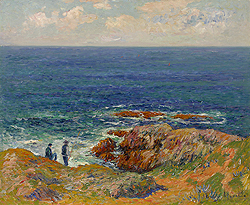 During these years Moret maintained a presence in a small town called Pouldu and continued to send works to the Salon, those relying on imagery based around the coasts of Brittany. Moret continued this artistic lifestyle of moving between cities before more firmly establishing himself at Pont-Aven in 1888, whose small town center had become an artistic refuge based around three hotels at which each of these artists would stay while they worked. Moret stayed at the Gloanec hostel where he came into contact with Gauguin, Ernest Ponthier de Chamaillard, Emile Jourdan, and Charles Lavant, among others. By July, Moret’s atelier had become the usual meeting place for a number of painters, where, on the first floor, a man by the name of Kerluen would give art lessons. Once autumn arrived, the painters dispersed but Moret remained at Pont-Aven. The following years saw both Moret and his fellow artists move between Pouldu and Pont-Aven, meeting regularly in each of these towns to nurture their artistic inclinations. It was Moret who had first established a presence in Pouldu, before the other artists of the group. During his period of activity around Pont-Aven and the other artists, Moret’s work showed an interest not only in coastal and marine scenes, but also figural scenes which, in some instances, began to embrace the world of symbolism, most likely influenced by Gauguin. While his work began to rely on symbolist themes, his style was indebted somewhat to Impressionism. It wasn’t until after 1891 that Moret, now no longer under the influence of Gauguin since he had departed France, could begin to work on developing his own style outside of the Pont-Aven school. In 1895 Moret made the acquaintance of the gallery owner Durand-Ruel who sponsored some of the most progressive artists across Europe. He entered into an informal contract with Durand-Ruel, and throughout his association with the gallery, completed over 600 paintings. Durand-Ruel also held exhibitions of Moret’s work in both Paris and New York and found a vast clientele for his imagery across the European continent and even with American buyers in cities from across the nation, such as Minneapolis, Portland, Pittsburgh, and Saint Louis. This same year Moret also began exhibiting at the Salon des Independents, where he showed seven pieces of Breton subjects. After 1900, Moret’s work took an even more Impressionistic approach, whereby he moved towards the application of small flecks of paint instead of the rather broad and somewhat geometric placement of colors as influenced by the Pont-Aven school. His interest in light effects began to take on new dimensions as he began focus on just landscapes, void of many or any figures and showing an interest in depicting the intangible – the sunsets, storms, and other effects of the atmosphere and nature – especially late in his career, around 1909. Between 1903 and 1911 he was also an active participant at the Salon d’Automne. He remained an active painter into the early twentieth century. 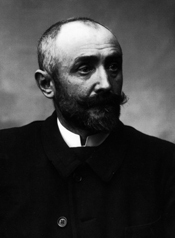 He died on May 5th, 1913 in Paris. During his funeral at Pere Lachaise, a friend spoke of Moret’s oeuvre that it “awaits the judgment that it merits.” (Henri Moret, aquarelles et peintures, pg. 123) After exhibitions in French museums, Moret’s work is taking on again, a more public dimension. It appears that judging simply from the output of Moret’s work while working under Durand-Ruel, over 600 paintings, that he should already be considered a prolific artist. But what Moret’s public, during his time, did not realize was the additional number of watercolors, drawings, and charcoal studies that he had completed. These were never sold to the public since Moret kept each one of them. It was not until 1983 that the public first glimpsed these important pieces, after Moret’s great grandson, in two shows, another in 1990, distributed over 800 of these personal works to buyers across the globe. The majority of his paintings, on the other hand, have remained primarily with their owners, totaling almost 800 as well. 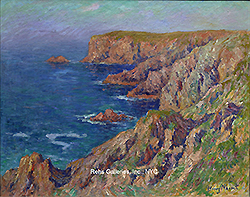 Henry Moret’s work characterizes the diversity of the period in which he was working. Initially influenced by his more classically oriented studies and the style of his predecessors, he quickly became engaged with other artists around Paris before moving to Pont-Aven where a unique artistic colony was established. Here, under the influence of Gauguin and others, Moret was introduced to a different style, a version that Moret would manipulate throughout the rest of his career. By the end, he had reached the definition of his own style based on Impressionism and the love of nature. His light filled palette continues to intrigue audiences today and the presence of his watercolors, drawings, and charcoals provides an important insight into the methods and style of this artist.